The ERRs are members of the nuclear receptor family. ERR's bind to estrogen response elements on DNA and modulate transcription but do not bind to endogenous estrogens. In addition, ERR's seem to have their own response elements termed ERRE's. ERR's have been shown to play a role in energy homeostasis and cancer. Proc Natl Acad Sci U S A. 2008 Jun 3;105(22):7821-6. Epub 2008 May 28. Ao A, Wang H, Kamarajugadda S, Lu J. Department of Biochemistry and Molecular Biology, University of Florida College of Medicine, P.O. Box 103633, Gainesville, FL 32610, USA. The development of intratumoral hypoxia is a universal hallmark of rapidly growing solid tumors. Adaptation to the hypoxic environment, which is critical for tumor cell survival and growth, is mediated primarily through a hypoxia-inducible factor (HIF)-dependent transcriptional program. HIF activates genes that facilitate crucial adaptive mechanisms including increased glucose uptake and glycolysis and tumor angiogenesis, making it an important therapeutic target. However, the HIF-dependent transcriptional mechanism remains incompletely understood, and targeting HIF is a difficult endeavor. Here, we show that the orphan nuclear receptor estrogen-related receptors (ERRs) physically interact with HIF and stimulate HIF-induced transcription. Importantly, ERRs appear to be essential for HIF's function. Transcriptional activation of hypoxic genes in cells cultured under hypoxia is largely blocked by suppression of ERRs through expression of a dominant negative form of ERR or treatment with a pharmacological ERR inhibitor, diethylstilbestrol. Systematic administration of diethylstilbestrol severely diminished growth and angiogenesis of tumor xenografts in vivo. Because nuclear receptors are outstanding targets for drug discovery, the findings not only may offer mechanistic insights into HIF-mediated transcription but also may open new avenues for targeting the HIF pathway for cancer therapy. Arany Z, Foo SY, Ma Y, Ruas JL, Bommi-Reddy A, Girnun G, Cooper M, Laznik D, Chinsomboon J, Rangwala SM, Baek KH, Rosenzweig A, Spiegelman BM. Ischaemia of the heart, brain and limbs is a leading cause of morbidity and mortality worldwide. Hypoxia stimulates the secretion of vascular endothelial growth factor (VEGF) and other angiogenic factors, leading to neovascularization and protection against ischaemic injury. Here we show that the transcriptional coactivator PGC-1alpha (peroxisome-proliferator-activated receptor-gamma coactivator-1alpha), a potent metabolic sensor and regulator, is induced by a lack of nutrients and oxygen, and PGC-1alpha powerfully regulates VEGF expression and angiogenesis in cultured muscle cells and skeletal muscle in vivo. PGC-1alpha-/- mice show a striking failure to reconstitute blood flow in a normal manner to the limb after an ischaemic insult, whereas transgenic expression of PGC-1alpha in skeletal muscle is protective. Surprisingly, the induction of VEGF by PGC-1alpha does not involve the canonical hypoxia response pathway and hypoxia inducible factor (HIF). Instead, PGC-1alpha coactivates the orphan nuclear receptor ERR-alpha (oestrogen-related receptor-alpha) on conserved binding sites found in the promoter and in a cluster within the first intron of the VEGF gene. Thus, PGC-1alpha and ERR-alpha, major regulators of mitochondrial function in response to exercise and other stimuli, also control a novel angiogenic pathway that delivers needed oxygen and substrates. PGC-1alpha may provide a novel therapeutic target for treating ischaemic diseases. regulation of a variety of genes including lactoferrin, osteopontin, medium-chain acyl coenzyme A dehydrogenase (MCAD) and thyroid hormone receptor genes. We expect to demonstrate that ERRa regulates muscle mitochondrial metabolism and plays an important role in the development of the insulin resistance that precedes type 2 diabetes. Physiological genomics identifies estrogen-related receptor alpha as a regulator of renal sodium and potassium homeostasis and the renin-angiotensin pathway. 2009 Estrogen-related receptor alpha (ERRalpha) is an orphan nuclear receptor highly expressed in the kidney, an organ playing a central role in blood pressure regulation through electrolyte homeostasis and the renin-angiotensin system. Physiological analysis revealed that, relative to wild-type mice, ERRalpha null mice are hypotensive despite significant hypernatremia, hypokalemia, and slight hyperreninemia. Using a combination of genome-wide location analysis and expression profiling, we demonstrate that ERRalpha regulates the expression of channels involved in renal Na(+) and K(+) handling (Scnn1a, Atp1a1, Atp1b1) and altered in Bartter syndrome (Bsnd, Kcnq1). In addition, ERRalpha regulates the expression of receptors implicated in the systemic regulation of blood pressure (Ghr, Gcgr, Lepr, Npy1r) and of genes within the renin-angiotensin pathway (Ren1, Agt, Ace2). Our study thus identifies ERRalpha as a pleiotropic regulator of renal control of blood pressure, renal Na(+)/K(+) homeostasis, and renin-angiotensin pathway and suggests that modulation of ERRalpha activity could represent a potential avenue for the management of hypertension. There is evidence that bisphenol A functions as an endocrine disruptor by binding strongly to ERR-γ. BPA seems to binds strongly to ERR-γ (dissociation constant = 5.5 nM), but not to the estrogen receptor (ER). BPA binding to ERR-γ preserves its basal constitutive activity. It can also protect it from deactivation from the selective estrogen receptor modulator 4-hydroxytamoxifen. Orphan nuclear receptor ERRalpha (NR3B1) is recognized as a key regulator of mitochondrial biogenesis, but it is not known whether ERRalpha and other ERR isoforms play a broader role in cardiac energetics and function. We used genome-wide location analysis and expression profiling to appraise the role of ERRalpha and gamma (NR3B3) in the adult heart. Our data indicate that the two receptors, acting as nonobligatory heterodimers, target a common set of promoters involved in the uptake of energy substrates, production and transport of ATP across the mitochondrial membranes, and intracellular fuel sensing, as well as Ca(2+) handling and contractile work. Motif-finding algorithms assisted by functional studies indicated that ERR target promoters are enriched for NRF-1, CREB, and STAT3 binding sites. Our study thus reveals that the ERRs orchestrate a comprehensive cardiac transcriptional program and further suggests that modulation of ERR activities could be used to manage cardiomyopathies. Almost all cellular functions are powered by a continuous energy supply derived from cellular metabolism. However, it is little understood how cellular energy production is coordinated with diverse energy-consuming cellular functions. Here, using the cardiac muscle system, we demonstrate that nuclear receptors estrogen-related receptor α (ERRα) and ERRγ are essential transcriptional coordinators of cardiac energy production and consumption. On the one hand, ERRα and ERRγ together are vital for intact cardiomyocyte metabolism by directly controlling expression of genes important for mitochondrial functions and dynamics. On the other hand, ERRα and ERRγ influence major cardiomyocyte energy consumption functions through direct transcriptional regulation of key contraction, calcium homeostasis, and conduction genes. Mice lacking both ERRα and cardiac ERRγ develop severe bradycardia, lethal cardiomyopathy, and heart failure featuring metabolic, contractile, and conduction dysfunctions. These results illustrate that the ERR transcriptional pathway is essential to couple cellular energy metabolism with energy consumption processes in order to maintain normal cardiac function. Neurons utilize mitochondrial oxidative phosphorylation (OxPhos) to generate energy essential for survival, function, and behavioral output. Unlike most cells that burn both fat and sugar, neurons only burn sugar. Despite its importance, how neurons meet the increased energy demands of complex behaviors such as learning and memory is poorly understood. Here we show that the estrogen-related receptor gamma (ERRγ) orchestrates the expression of a distinct neural gene network promoting mitochondrial oxidative metabolism that reflects the extraordinary neuronal dependence on glucose. ERRγ−/− neurons exhibit decreased metabolic capacity. 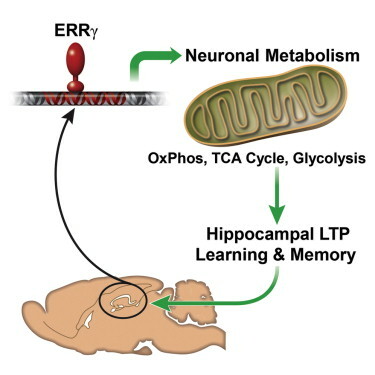 Impairment of long-term potentiation (LTP) in ERRγ−/− hippocampal slices can be fully rescued by the mitochondrial OxPhos substrate pyruvate, functionally linking the ERRγ knockout metabolic phenotype and memory formation. Consistent with this notion, mice lacking neuronal ERRγ in cerebral cortex and hippocampus exhibit defects in spatial learning and memory. These findings implicate neuronal ERRγ in the metabolic adaptations required for memory formation.